The accommodation occupies 8 gracious tipical Sicilian rooms. Offering charm, character and an unrivalled dedication to hospitality. 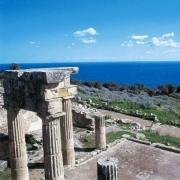 B&B Oleaster is within 15 minutes to Palermo and most important historical site of west Sicily. Guests enjoy the Breakfast in a famous bar café’ within few metres from the B&B. Our spacious rooms represent real value when compared to prices for similar accommodation in our city centre location. Highway A19, exit Villabate - continue SS121 for 14 km - til Bolognetta release.